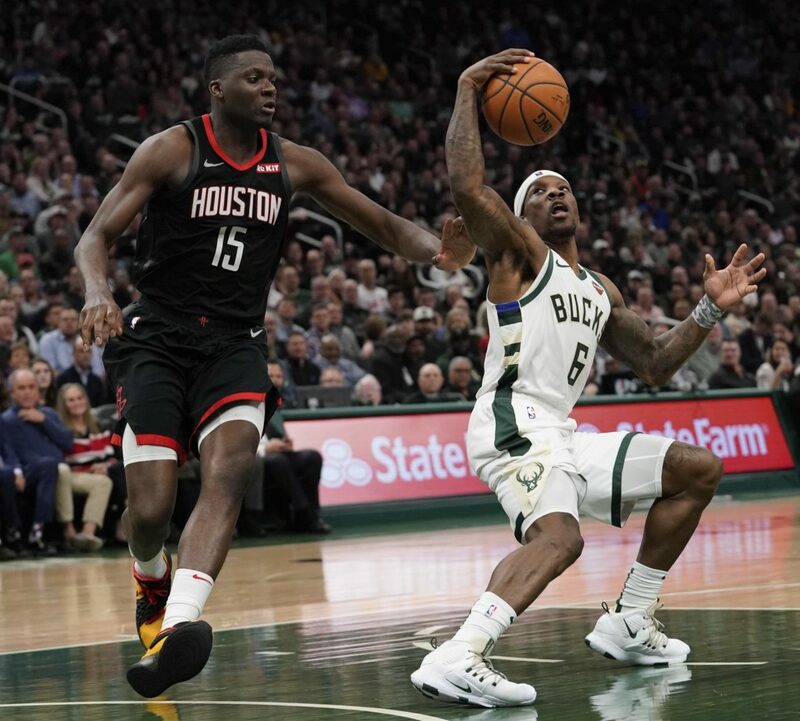 MILWAUKEE — Eric Bledsoe scored 23 points, including 16 in a decisive third quarter, and the Milwaukee Bucks beat the Houston Rockets 108-94 on Tuesday night. Giannis Antetokounmpo had 19 points and 14 rebounds for Milwaukee, which improved to an NBA-best 56-19. James Harden scored 23 and Chris Paul 19 for Houston, which lost for just the third time in 17 games. Harden shot just 9 of 26, including 1 for 9 from 3-point range with Bledsoe closely guarding him throughout most of the game. After a tightly contested first half, the Bucks grabbed control in the third, sparked by Bledsoe’s clutch shooting. Leading by five at halftime, Milwaukee built a 19-point lead in the third. Bledsoe went 4 of 5 on 3-pointers in the period after missing his only two attempts in the first half. His third-quarter output nearly matched the 18 points scored by Houston. Milwaukee held the Rockets at bay for most of the final quarter, maintaining a double-digit lead throughout before clearing the bench with about a minute left. The Rockets jumped out early, building a 10-point first-quarter lead without Harden doing the bulk of the scoring. Danuel House Jr. paced Houston with nine points in the period, making all three of his 3-point attempts. The Bucks struggled in the opening period, shooting just 8 of 25, including 3 for 13 from deep. Khris Middleton missed all six of his shots in the first quarter. Milwaukee fought back in the second and eventually grabbed the lead. A key sequence came midway through the quarter when, after a basket by Ersan Ilyasova, Bledsoe stole the inbounds pass, scored and then stood face-to-face with Harden under the basket as the crowd roared. The Bucks led 58-53 at the break, paced by Antetokounmpo’s 13 points and eight rebounds. Paul scored 14 and Harden 12 in the half for Houston. Harden, P.J. Tucker and Eric Gordon combined to shoot 1 for 9 from 3-point range over the first two quarters. The Bucks outscored the Rockets 19-0 on fast-break points in the first half. Rockets: Gordon started despite dealing with an injured right ankle sustained Sunday. . F/C Kenneth Faried sat out with a sore left knee. .G/F Gerald Green is expected to be out for seven to 10 days with a strained adductor. Bucks: G Tony Snell didn’t play due to a left ankle sprain. Snell rolled the ankle Sunday in the second half versus Cleveland. Milwaukee coach Mike Budenholzer said he expects Snell to return for the start of the playoffs. . G Donte DiVincenzo (bilateral heel bursitis), C Pau Gasol (left ankle soreness), G Malcolm Brogdon (right foot plantar fascia) and F Nikola Mirotic (left thumb sprain/fracture) remained out. Rockets: Host the Denver Nuggets on Thursday. Bucks: Host the Los Angeles Clippers on Thursday.